Trakai Island Castle is an island castle located in Trakai, Lithuania on an island in Lake Galvė. The castle is sometimes referred to as "Little Marienburg". The construction of the stone castle was begun in the 14th century by Kęstutis, and around 1409 major works were completed by his son Vytautas the Great, who died in this castle in 1430. 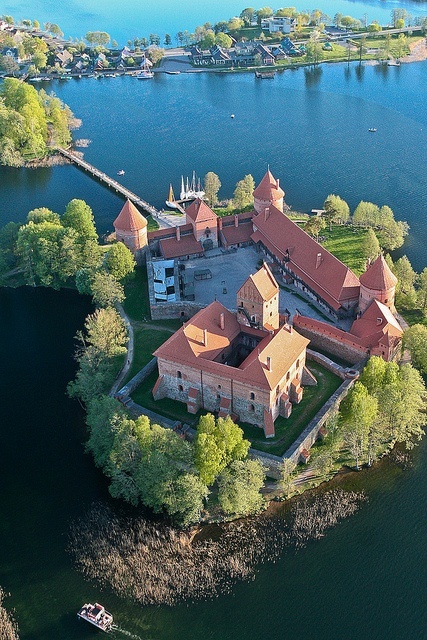 Trakai was one of the main centres of the Grand Duchy of Lithuania and the castle held great strategic importance. During the 19th century, castle reconstruction plans were prepared. Its original frescos were preserved and copied by Wincenty Smokowski. The Imperial Archaeological Commission initiated the documentation of the remaining castle in 1888. In 1905 the Imperial Russian authorities decided to partially restore the castle ruins. During World War I, Germans brought in their specialists, who made several attempts to restore the castle. In 1935-1941 parts of the Ducal Palace walls were strengthened, and the southeastern forecastle tower was rebuilt, including sections of its walls. Lithuanian and Polish preservationists worked on the project, but the work stopped when the war gained in intensity. After World War II, a major reconstruction project was begun in 1946; active work started in 1951-1952. The major portion of the reconstruction was finished in 1961. The castle was reconstructed in a 15th century style.